Hello, hello sorry for the delay - I know its Thursday - as ever I have lots of excuses. Firstly, I have been fully engaged on an exercise mission. I didn't bother to weigh myself Monday as I didn't feel lighter in the slightest and I was truly pissed off with myself. I used to manage at least 4 exercise sessions a week and since November this has dwindled somewhat. I am eating about 1700 calories a day which is too much. I can maintain and sometimes lose a 1lb but I need to aim for 1,000 which will allow for things that haven't been calculated correctly. Its just a fact of life I don't need a lot of calories and I find that the hardest. So, on Sunday I went for a 10 mile bike ride - I was quite surprised as I thought this is going to be tough but I'm glad to say that my fitness levels, whilst not at their peak, hadn't diminished entirely. On Monday, I put my workout gear on and armed with my Ipod, power walked for an hour. On Tuesday the worst day of the week for exercise (I some how think I'll manage to fit in a workout in - it never happens), it suddenly occurred to me that I needed to make a better job of finding time but when? I don't like to exercise in the evening - did I have to totally re-think that. No, I set the alarm clock for 6am. Yup, maybe to some that's not early but for me its the middle of the night. I did my weights DVD and then did about 70 skips in the garden making sure the neighbours didn't see me. On Wednesday, I did 42 lengths of the swimming pool cut short by my bladder control - still can't wee in the pool. Just can't do it. Its Thursday today, another day where I struggle to fit in the exercise so, you've guessed it, I set the alarm clock again for 6 am and did a Wii dance workout. It was only for 40 mins and minus the wrist weights but it was something. Tomorrow, I plan on another swim. So that's 5 workouts since Sunday with one due tomorrow. I also decided to set up a facebook group all about fitness - to share workouts, classes etc which I think is really useful. So what of the battles - well nothing major but enough for a mini rant - take Amazon, normally no complaints. I tried their Amazon Prime for less than the 30 day trial but found out today they'd taken £79 out of my account. I complained and immediately they said they would refund - only just a minute ago I got an email welcoming me to Prime!! Arggh. Then take Ancestry.co.uk - the ultimate in bad service I mean they are so bad they make Santander look good. I haven't used the account for years - but they've decided I now have membership but will take money out of my husband's account who, by the way, only signed up for a free trail. I see a pattern emerging. This is why I don't like free trails as it just equals a whole load of hassle you don't need. In real terms it probably suits these companies as if they take out money from everyone's account and hold it for a few weeks that's a pretty penny in interest isn't it. Call me an old cynic. Speaking of which my husband is 50 today! Wow - how did that happen. I have known him since he was 35. 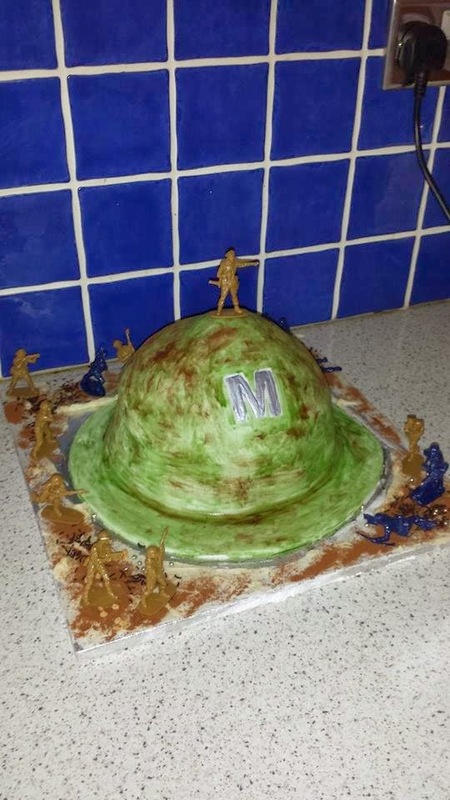 Anyhow, as he likes all things militrary (not outfits and re-enactments thank goodness) I baked a helmet cake. Matron! He also got a family pop art portrait of us all wearing helmets too and we are off to France next week to look at WW1 bits and bobs. Anyhow, seeing as it is his birthday I best get off here! See you tomorrow as got more to say on these no make up selfies and cancer research and facebook comments.